Thriving in Motherhood (and other demanding seasons of life). Moms, did this title grab you?! Surely by now, they have come up with just two or three steps that I can adopt, which will help me pull it all together, so that I can proudly say “I got this.” And THEN, I’ll sit down, put my feet up and read my book with my coffee in peace, while things around here are off and running effectively. Perpetually. My heart claws for something, ANYTHING to make this motherhood journey more graceful, clear, predictable, and if possible, that I remain largely undisrupted. Regrettably, there is always more. More laundry, more groceries, more dishes, more clutter. More spit-spray on that bathroom mirror. All this endless hassle-work when our souls are screaming for rest, solace, order. (When you think about it, everything under the sun constantly moves toward disorder, and we can only do so much to subdue the process.) Not only does it feel as though I am simply biding my time, but I am starting to develop this rather awful martyr mentality. I want to enjoy THIS, to thrive IN it, to draw strength FROM it, rather than just bear it. I want to do this well. Sorry, I don’t have that many answers, but I have found one thing. This is as life-altering as discovering clean eating in that epic Urban Gets Diesel post back in July ’09. 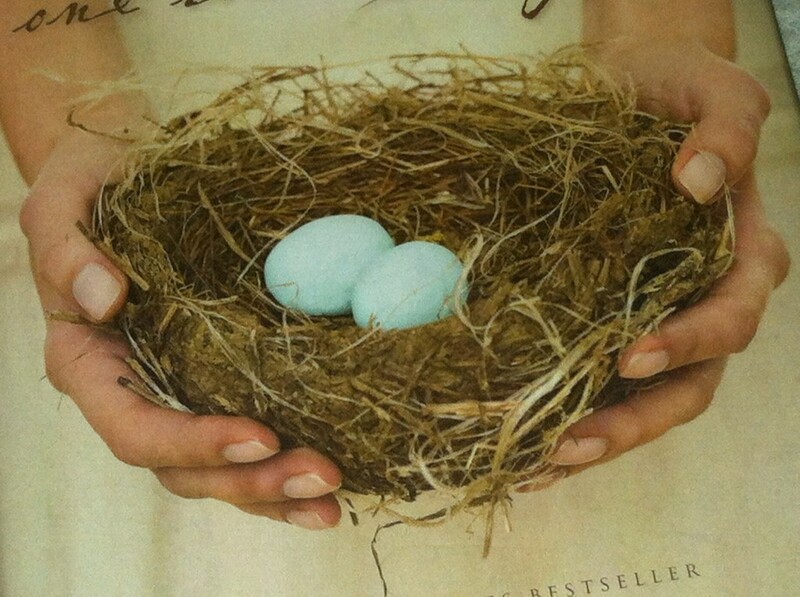 About a year ago I read a beautiful book: One Thousand Gifts: A Dare to Live Fully Right Where you Are by Ann Voskamp. I am now doing the corresponding devotional that accompanies it. Squeals of joy over a bubble bath. The smell of that first cup of coffee greeting me in the dark hours of the morning. Peaceful warblings of our parakeets. How much they love those parakeets. Her one golden curl that always flies away in the same spot. Broad shoulders in his Army uniform. Reddish glow on the backyard as the sun rises over the mountains. Happy songs coming through the baby monitor. Little fingers playing the piano. Freshly laundered pullover, still fragrant and warm from the dryer. Steam rising from 5 piping hot dinner plates. Can I tell you what has happened to my outlook ever since I began this discipline? A complete paradigm shift. Chaos waned. The mundane and tedious is seasoned with surprises and blessings that make every day fresh, and far more fulfilling. As the list grows, these “little” things begin to take on big significance. This is living. This is enjoying. This is grace. It’s a constant stream of gifts from the Lord just for me. I have become obsessed with looking for them. It’s seeing the goodness of the Lord in the land of the living (Psalm 27:13). And, it’s the only way I have been able to successfully apply 1 Thessalonians 5:18– give thanks in all circumstances; for this is the will of God in Christ Jesus for you. Laundry will never be done, the dishes will always pour in. Legos, broken crayons, birdseed and matchbox cars scatter everywhere, and fingerprints smear all the way up and down the walls of the stairwell. But, LIFE is happening all around me. And it is beautiful. This discipline of gratitude is crucial to counter life’s brokenness, disappointments, frustrations, disorder. We are surrounded by innumerable graces and glories. Actively noticing is how we enjoy it, or else we are at risk of becoming very bitter, worn out, and jaded. Just like we are striving to eat clean, we must think clean. Grab a notepad, or get the app! Tune in to the amazing beauty and grace around you, and start really living. Every season can be the prime of your life! 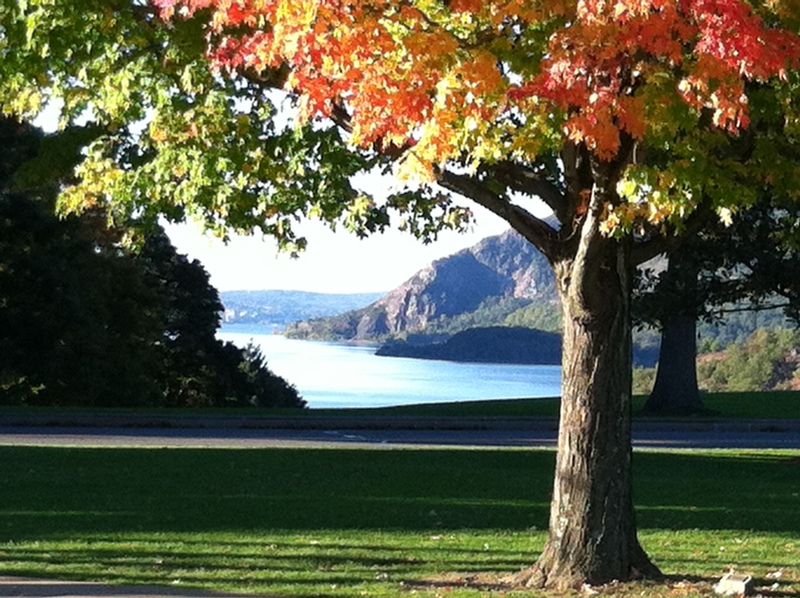 I live here, and I am blessed to see this view on a daily basis. The graces captured in this image are countless. You write so beautifully!! Thanks for the reminder… Thanks for pointing me toward truth! Wow! I really need to read this this morning. As the chaos around me seems to want to drown me I am learning to be desperately dependent on Christ. Through that I am finding the joy and thanksgiving (also with help from that devo) in life but it is SO easy to forget the clinging to Christ and fight the chaos around instead. Thank you for the reminder to stay focused on the things I can do, chose to live in thanksgiving and joy. Andrea, I really think the enemy of our families wants us to feel drowned day after day. And by no means does my writing of this post mean I have it all together, but this book/the journal is such a help for me to rise above. In her devotion p.42 she writes “I will forget again, and again, and again…” I am just like that–I have to remember to remember…with the help of Christ. Very true! After nearly three years of constant trials that seem to pound on my soul like relentless waves…the kind of waves that slowly erode the shore until no visible beach is left… I began doing just THIS! I have my own “focus list” of all the small stuff (which is really BIG stuff) to be thankful for. However, it has become more than just a list. It has become part of my thought processing. It is amazing what you begin to notice when you begin to intentionally seek out positives to offset the obvious and perpetual negatives. I started telling myself how doing 6 loads of laundry for 6 people was a blessing. I literally spoke to myself in my head and said, “How blessed am I to wash these 6 loads rather than be all by myself washing 1”. This “paradigm shift” as you mention, is what has helped me keep going…and what has helped me keep smiling. It is what has held my marriage together and what has kept the desire for me to continue to strive towards creating good memories for our kids and our family. On the many days I felt like I was going to literally crumble to the floor, Jesus was alive holding me up…helping me to take every thought captive. How do I know this as truth? I’m still here…still smiling, still washing throw up off sheets this morning and praising God that I have a washer machine AND fresh water! I’m nursing a toothache today and thanking the Lord for allowing man to invent Motrin. I’m praying for my husband’s day at a new job as he works on the other side of the country this week, yet I am thankful that our bills will get paid this month. I am using the little energy I have left to breastfeed an insatiable infant while thanking God that I have a beautiful son and don’t need to spend more money on formula. I am fighting off a headcold and thankful that I have wonderful friends praying for me and my sick daughter…AND that there is chicken soup to defrost in my fridge. I’m dealing with unfairness from someone that has lied against us, but I am thankful to have the opportunity to be obedient and pray for an enemy. I am trying to figure out how to get the strength to go to the grocery store, but I am thankful I don’t have to shoot a rabbit in or to feed my family. The process goes on and on… This was just from this morning!!! Yet it is this very process and way of intentional gratitude to God that has maintained my hope, joy, strength and desire to smile when everything else “under the sun” tries to put clouds in the way! This is awesome. We can turn what seems like hassle on its head. But also, it’s not just a Pollyanna-glad-game…rather, documenting those seemingly little things around us that just bless us. THIS is the HOW of Philippians 4:8. I really like how Voskamp mentions that Paul, in prison, says “I have learned how to be content…” He says it twice: I have learned. She says, “could the list teach me even that hard language? Over time?” It’s a language we have to learn, and I am right there with you putting it to practice. Nice refocus Leigh…it was a great reminder for me. 🙂 Miss you dearly. Leigh, thank you so much for this post… and for this book. i’m so thankful for you! 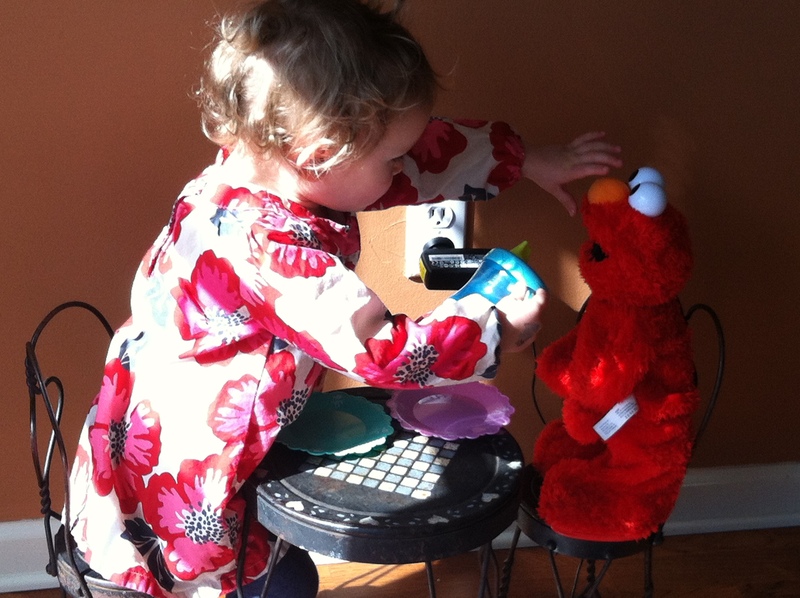 The picture of Adair having a tea party with Elmo is priceless! We need to frame it.